SAINT PETER, Minn. – The Gustavus women’s hockey team hosted UW-Superior on Tuesday night and shut out UW-Superior by a score of 4-0. With the win the Gusties move to 9-4-2 overall while the Yellowjackets fall to 7-11-1. The first period was controlled by Gustavus as they outshot Superior by a tally of 13-4 but neither team mustered a goal as the period went scoreless. The second period was a different story though as the Gusties outshot the Yellowjackets 14-7 and found the back of the net three times in the process. They got the scoring started at the 6:28 mark when Hannah Kobienia (Fy., Willmar, Minn.) notched her first goal of the season a slapshot from the point off an assist from Lilia Scheid (Fy., Stillwater, Minn.). Kayla Vrieze (Fy., Eagan, Minn.) kept the scoring going on a similar play at the 12:07 mark when she scored a power play goal from near the blue line with assists going to Scheid and Allie Stanger (Sr., Paynesville, Minn.). Just over two minutes later Vrieze took another shot that was saved by the Superior goaltender but Amelia Vosen (Jr., Nowthen, Minn.) was right there for a rebound opportunity and scored to extend the lead to 3-0. Stephanie Anderson (Fy., Blaine, Minn.) was also credited with an assist on the goal. The game went scoreless for over 20 minutes until Scheid got a rebound for a goal that was assisted by Anderson and Stanger at the 18:46 mark of the third period. The Gusties held the Yellojackets scoreless for the remainder of the game for the 4-0 win. In the contest Gustavus saw solid goalkeeping from Paige Press (Sr., Cottage Grove, Minn.) and Emilia Helms-Leslie (Fy., Fairbanks, Alaska). Press started the game in net and went two periods making 11 saves and Helms Leslie played the third period and made seven. 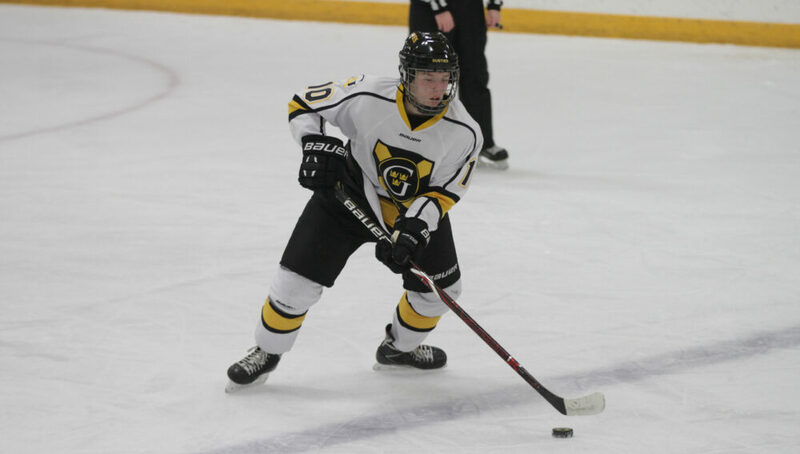 Gustavus is next in action Friday when it hosts Augsburg for a 7 p.m contest.